The Government's of PNG and Australia have gone ahead and signed the Memorandum of Understanding for the Joint Initiative at the Lombrum Naval Base on Manus Island. This is despite opposition from the locals with support from their Governor Charlie Benjamin on the lack of consultation with them on this development. 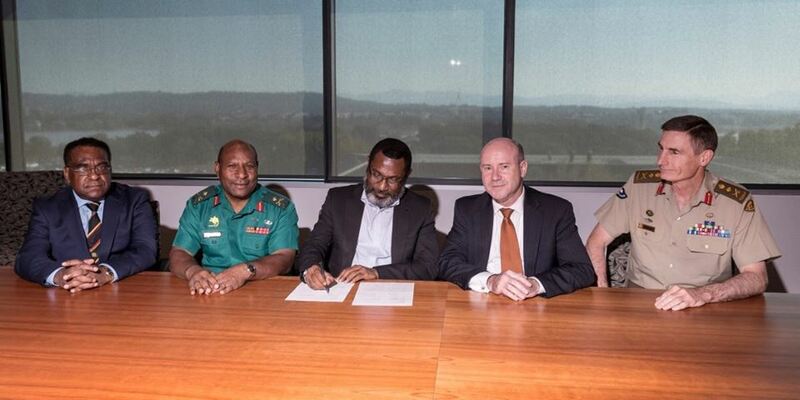 The MoU, titled the Lombrum Joint Initiative, was signed in Canberra last Friday by Defence Secretaries Trevor Meauri (PNG) and Greg Moriaety (Australia), and Defence Force Chief Major General Gilbert Toropo (PNG) and General Angus Campbell (Australia). Secretary Meauri said the MoU formalizes the joint announcement by Prime Ministers Peter O’Neill and Scott Morrison on 1st November 2018. He said it was a Defence to Defence understanding, and helps to guide the collaboration between the two countries to redevelop facilities at Lombrum Naval Base. Mr Meauri said the initiative would increase interoperability between the two Defence forces and provide greater opportunities for training and joint activities.